There are aces on set points, mind-blowing winners on set points and then there’s this! On Monday, Fabio Fognini did something on set point, that is pretty much unthinkable. 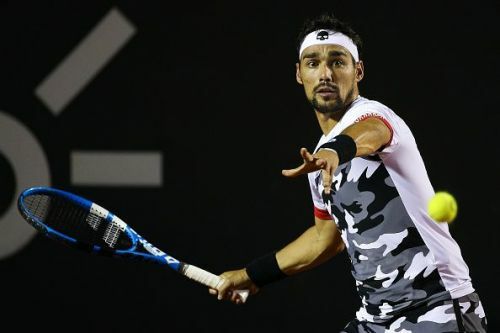 At the ongoing Rio Open -- an ATP 500 tournament played on clay at Rio de Janeiro, Brazil -- the fifth seeded Italian mesmerized the crowd with his miraculous recovery skills after his racquet slipped out of his hand while he served for the second set against Thomaz Bellucci in the first round. The incident happened with the 21st ranked Fognini serving at 6-5, 40-30 in the second set, with a set point in hand. It was a crucial juncture of the match as the Italian had earlier conceded the opening set 6-7(5) in a tie-break. Knowing fully well how important that one point was for him, Fognini displayed extraordinary reflex action right after his racquet fell to get hold of it again and continue the rally. The 123rd ranked Bellucci, a wildcard at this event, tested him by pushing him deep, but it was of no avail. Fognini came charging to the net and finished the point beautifully with a backhand smash. Surely, there couldn't be a more dramatic way to close out a set! Fognini later on won the third set as well to complete a 6-7(5), 7-5, 6-2 win and progress into the second round.